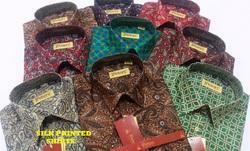 The wide assortment of shirts offered by us also includes Printed Silk Shirts. The prints on the shirts are creatively designed with the help of our experienced designers, and are latest in design. Our collection of silk shirts is available in multitude of colors that are highly appealing and go with every occasion. 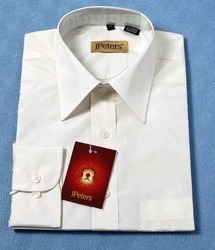 Further, we also offer customized range of shirts to our valued clients, so as to offer them with exclusive shirts. We are a leading manufacturer for Corporate Logo Ties with custom designed as per customer requirement. 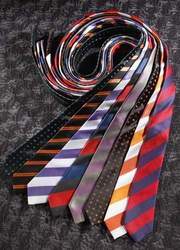 Neck Ties are available in following designs and patterns. Our ties comes up with the supreme finish. 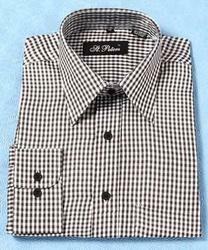 We also manufacture Formal Shirts, using finest quality silk fabrics. Our range of shirts is available in all standard sizes and in varied designs and colors. The plain silk fabric of the shirts adds a glamorous look to the wearer's personality, and is best to be worn in parties. Available in standard sizes, these shirts can be availed from us at market leading prices. Types : Full Sleeves Note: Product available from Rs 500 onwards to Rs 2300..
Mens Shirts offered by us are manufactured keeping in mind the latest designs and color matching. Available in a plethora of colors and exclusive designs, these shirts are extremely comfortable, finely stitched and tailored as per the designs and specifications of our esteemed clients. 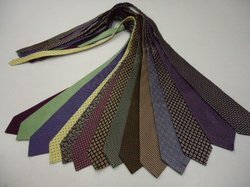 Fashion Printed Silk Ties are wide in demand because of their fine design and trendy colour. They are available in about 100 colours and can be made as per the client. Leveraging on our industry experience, we have been offering an exquisite range of Men Neck Ties, Silk Shirts. Apart from these, we are also engaged in supplying Dupion Silk Shirts & Silk Stripes Shirts. Our range is designed using high-quality fabrics and threads, which are procured/import from authentic vendors, after a stringent quality check. These clothes are appreciated for a number of features including quality fabrics, color fastness, fine stitching and increased strength. Marketed under the brand name "JPeters" we are able to supply our range in India and to a few Stores in U.A.E as well. In addition, our products of Silk Shirts and ties are available in best retail stores in South India. With the support of our expert designers, we are able to design a range, which caters to the needs of both domestic as well the international market. Further, our advanced in-house designing unit is installed with the latest, Jacquard looms, which help us in crafting a flawless range. Moreover, our products are available at competitive rates, and are known to achieve maximum customer satisfaction.